24 hours after leaving their homes, the Palestinian and Israeli participants were greeted by their Canadian counterparts at Vancouver International Airport. 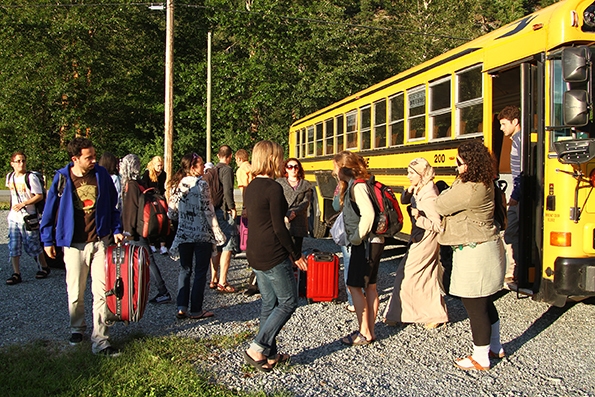 A two and a half hour bus ride after that, they were at the Copperdome Lodge in beautiful Pemberton, BC. Over the next 10 days, these young peace-builders will be taking part in mediated dialogue sessions, exploring issues that both divide and unite them. Then it's off to UBC where they'll be writing, directing, shooting and editing short films about the Israeli/Palestinian conflict. It's going to be an intense few weeks and it looks like we have a fantastic group of participants who are going to make Peace it Together 2011 an unforgettable experience. Join us by following along on twitter and right here on our brand new blog!